Knee pain is one of the most common ailments that can make it difficult to carry out everyday activities such as walking, climbing stairs, playing your favorite sports, and so on. Tendonitis – Irritation and inflammation of tendons around the knee due to repetitive use can make your knee hurt. The affected area will usually swell up, and the pain will increase when you move or flex the knee. Bad form – Keeping a bad form while performing any physical act or working out at the gym can lead to injuries. Cartilage injury – Any sudden and sharp change in the direction of the knee joint can lead to a torn cartilage. The cartilage is what keeps the knee cushioned, and its wear and tear can cause knee pain. Sprained ligament – Once a ligament gets sprained, it doesn't return to its regular shape and rigidity, giving way to an unstable knee and pain. Being overweight can also increase the stress on your knees causing pain. Always warm up before doing any kind of exercise. Stretch your quadriceps and hamstrings before and after a workout. If the pain is due to an injury, follow the RICE method as first aid. Rest - Give rest to your leg to protect the injured area. Ice - Exposing the injury to cold temperature with an ice compress will numb the area, giving you relief from the pain. It will also bring down the swelling quickly. Compression -Wrapping the area with an elastic bandage will give it support as well as reduce the swelling. Elevation - Elevate the knee using pillows to reduce blood circulation in the area and thus reduce swelling. If you have suffered a knee injury, ice compress will work quickly to bring down swelling and pain. (2) Even in the case of arthritis, ice helps temporarily numb the area, reducing the burning sensation and inflammation. Patients who have done knee replacement surgery can also use ice packs along with medications for pain management. 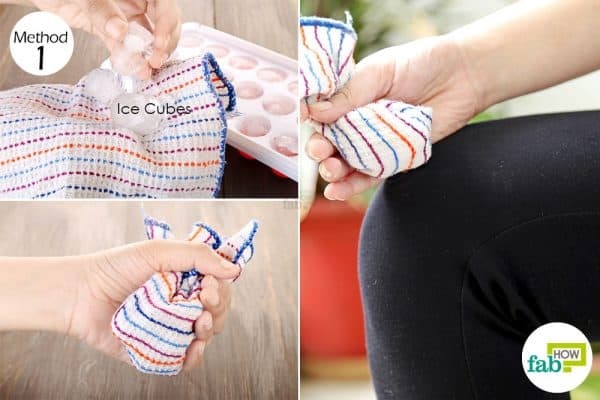 Put 3 to 4 ice cubes in a flannel cloth. Bundle it up and use it as a cold compress around the knee. Elevate your leg by keeping a pillow under it. Make sure to apply the compress on the back of the knee as well as for all-round healing. 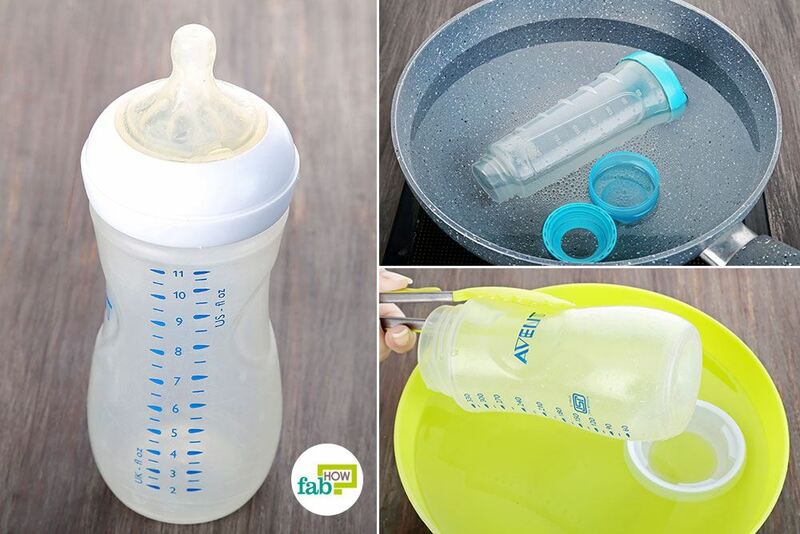 Use it for 15 to 20 minutes; add more ice cubes, as needed. Ice compress will give immediate relief from the pain. You can use it 3 to 4 times a day until swelling has come down sufficiently. Apple cider works in a number of ways in alleviating knee pain. When taken internally, it alkalizes the body and reduces inflammation; resulting in the reduction of pain. Take ¼ cup of raw and unfiltered apple cider vinegar. Add to it a ½ tablespoon of cayenne pepper. Also, add ½ tablespoon of grated ginger. Mix the ingredients well and apply it over the knee. Leave it on for 20 minutes, and then rinse with warm water. 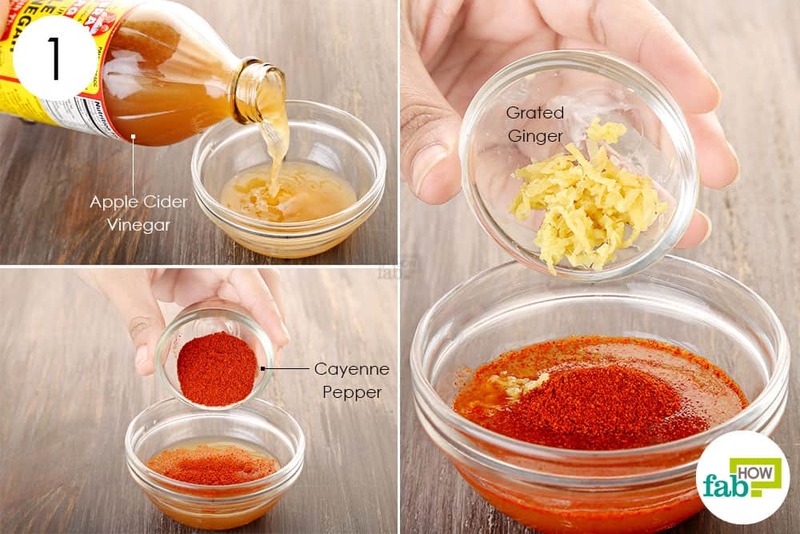 Apply the mix twice a day for 4 to 5 days to get rid of the swelling and see improvement in pain. Continue with the remedy until the pain is gone. You can also use alternating hot and cold compresses for chronic pain. 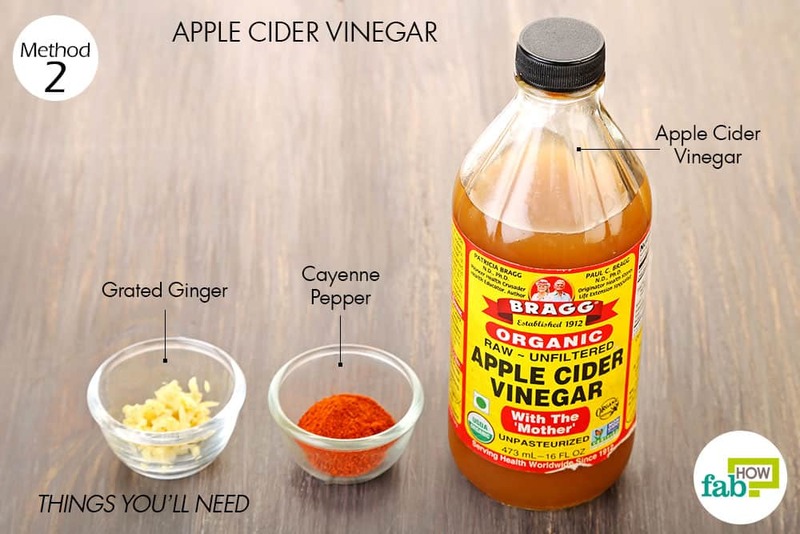 Additionally, mix 2 teaspoons of apple cider vinegar in 1 cup of water and drink this twice a day until the pain is gone. This helps dissolve mineral build-up in and around the knee. The antioxidants present in turmeric also help in quicker healing of any injury, if that is what is causing you pain in the knee. 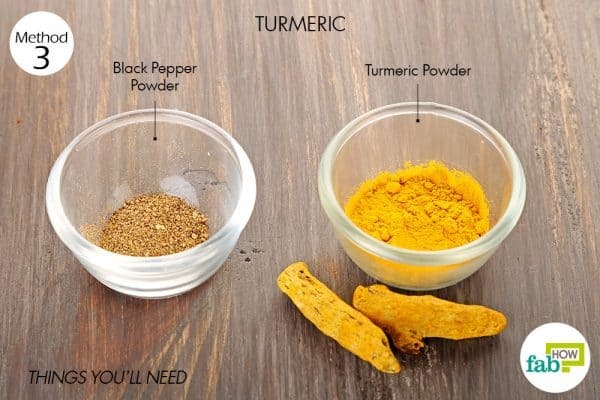 You can also add black pepper to the turmeric as it works as an analgesic. Consuming golden milk will also work in the same way. Note: Do not try this remedy if you are on blood-thinning medication. Add ¼ teaspoon of black pepper powder to 1 teaspoon of turmeric powder. Mix the two well and consume. For easier consumption, you can add the mix to a glass of warm milk. 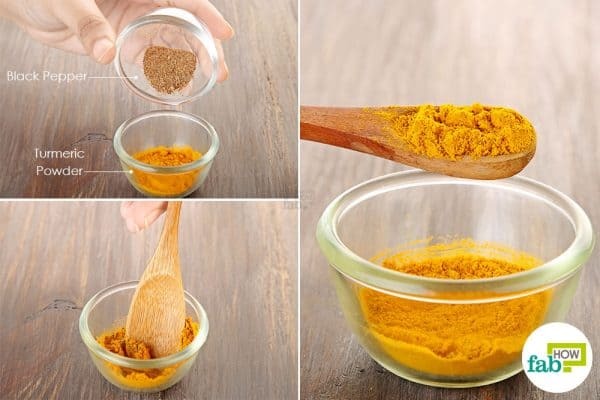 Consume the turmeric and black pepper mix twice daily. You should see improvement in a week. It may take longer depending on the nature of the pain. Continue taking it until the pain is completely gone. If you find it difficult to consume the powdered form, you can take 500 mg of turmeric supplement twice a day. If the pain has been there for quite some time, it can take as long as 6 weeks to get rid of it completely. 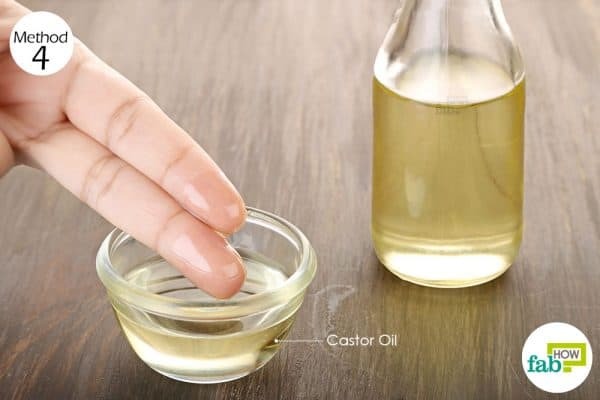 Castor oil is quite effective for pain management as it is readily absorbed by your skin and targets the inflamed tissues directly. 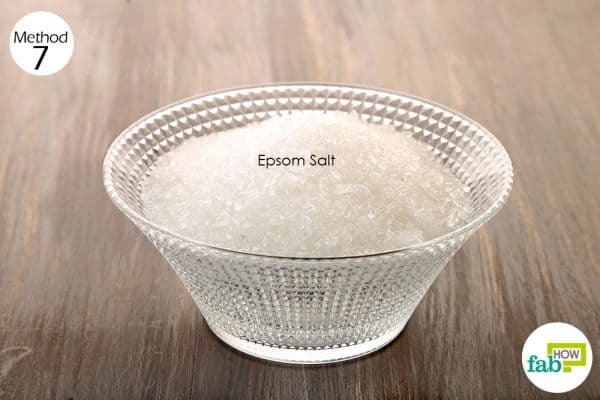 Its anti-inflammatory properties have made it a popular remedy for arthritis pain, sciatica, and back pain. Using small circular motions, massage the oil over the aching knee. Allow the oil to work overnight. Alternatively, you can soak a cotton cloth in this warm castor oil and put it on the knees. Cover it with cellophane and leave it overnight. You should see some improvement in pain after the very first night. 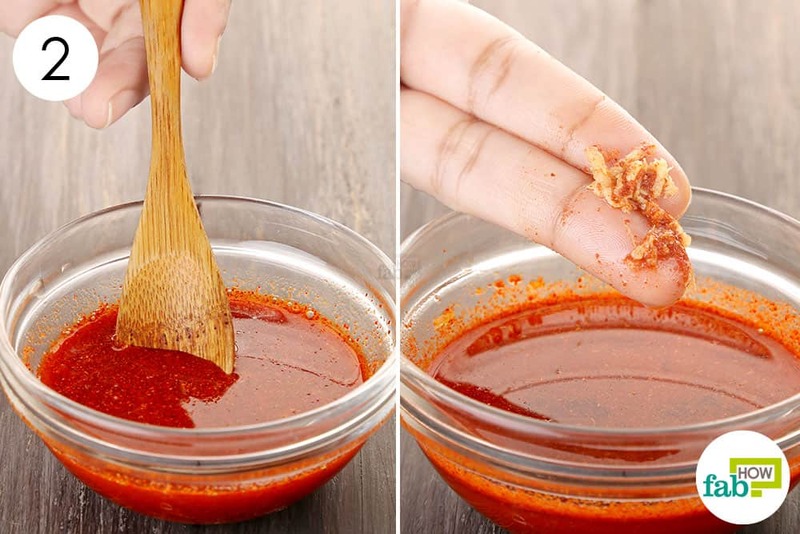 Continue using it every night for 1 or 2 weeks to get rid of knee pain completely. 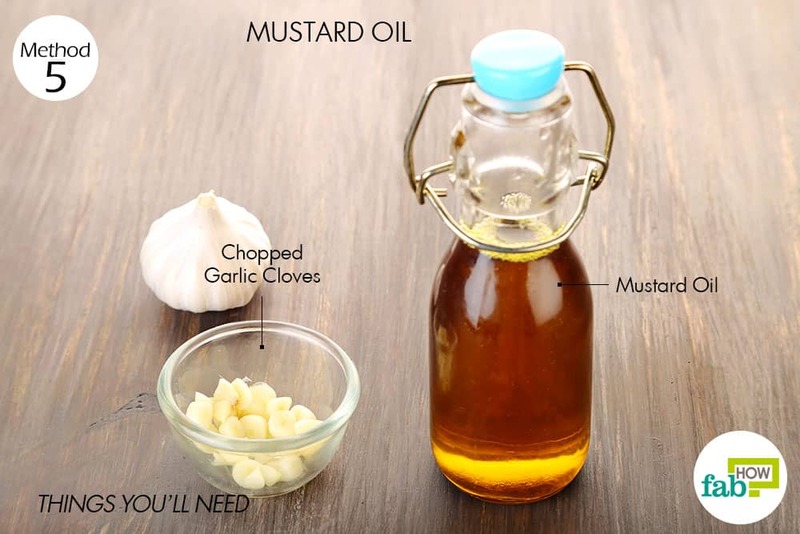 Combine it with some garlic, another anti-inflammatory agent, and use it to massage your aching joints and muscles. 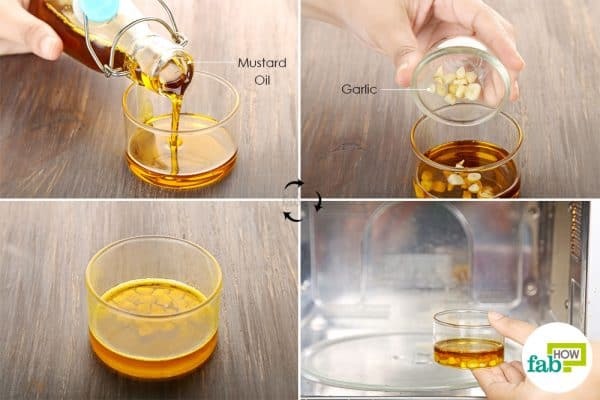 Pour around 2 tablespoons of mustard oil in a container. Add 1 tablespoon of chopped garlic to the oil. Cook the oil in a microwave for 5 to 7 minutes. Take it out and allow the oil to cool down a bit. Once the oil has turned comfortably warm, use it to massage the painful knee in circular strokes. Do this for a couple of minutes. Place a hot compress over it to soothe the pain. Use this oil to massage the knee once a day to notice an improvement in 1 or 2 weeks. Continue until you get rid of the knee pain for good. Tart cherries, on the other hand, work as anti-inflammatory agents. There couldn’t be a tastier cure than this for treating knee pain. 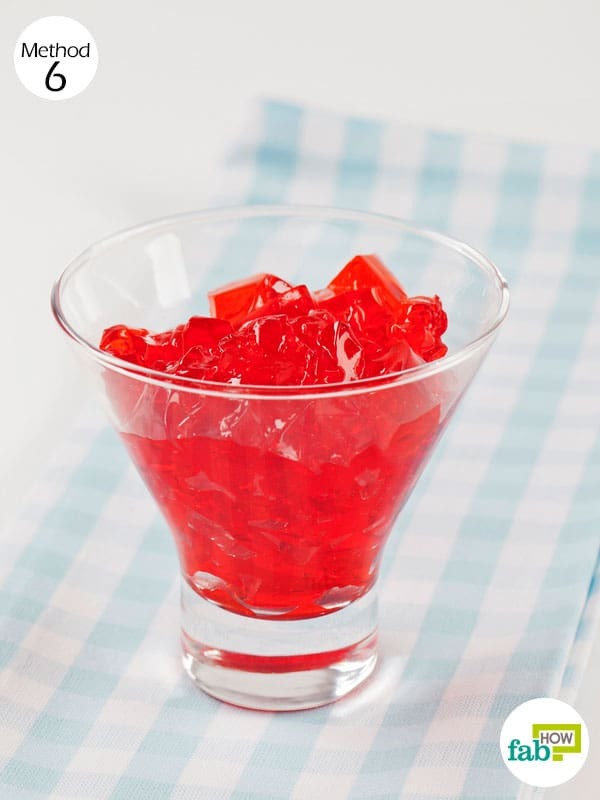 Add 2 tablespoons of gelatin to ½ cup of tart cherry juice. Consume this tart cherry gelatin mix every morning. You should see improvement in 1 or 2 weeks. Continue taking it for 1 month to notice an improvement in chronic knee pain. Magnesium is an essential mineral required by your body to function properly. Magnesium is also essential for calcium absorption in your bones. Hence, a deficiency of magnesium could sometimes lead to knee pain and muscle soreness. (8) Also, magnesium is better absorbed through the skin than taken orally. To give yourself a magnesium boost, add some Epsom salt (readily available source of magnesium) to your bath water and soak in it. Do this daily for 2 to 3 weeks or until the pain is sufficiently reduced. Gin-soaked raisins have been an age-old remedy for treating arthritis pain. Gin is flavored using the juniper berries that are believed to have potent antioxidants and strong anti-inflammatory properties. 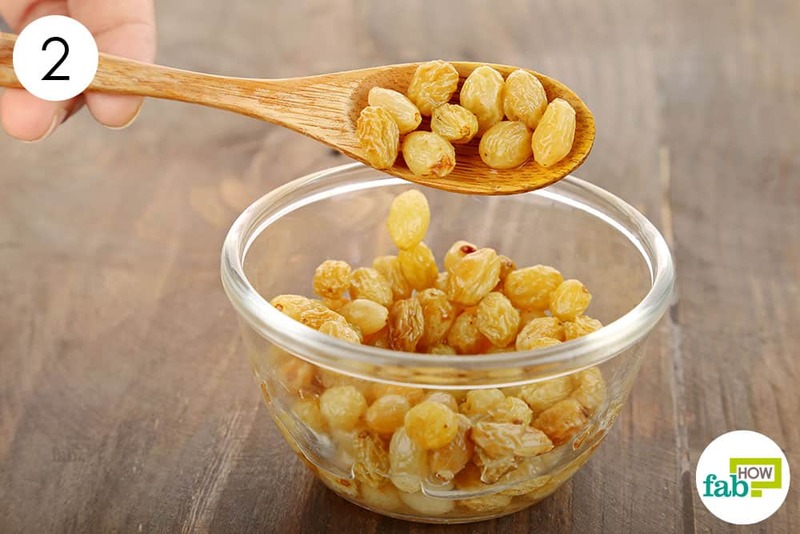 Golden raisins are also rich in vitamin C and ferulic, gentisic, and salicylic acids that are known pain relievers. Sulfides used to treat raisins have also shown some anti-inflammatory properties. 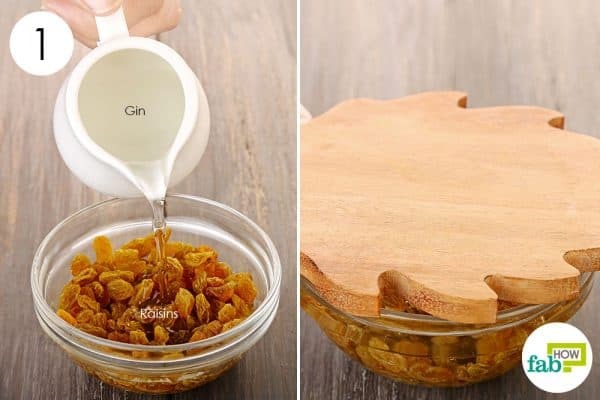 Take half a cup of raisins in a shallow bowl. 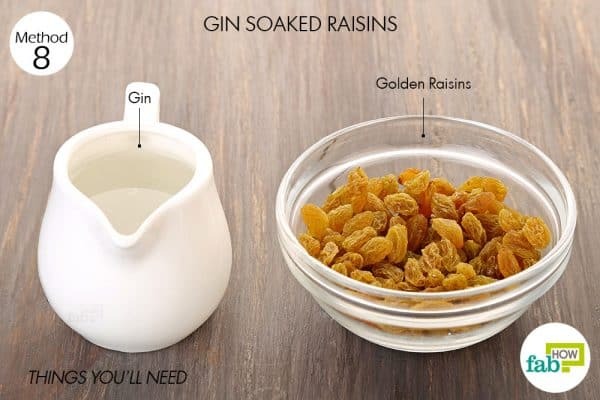 Pour in enough gin to submerge the raisins completely in it. Cover it with a lid and allow it to soak for 7 to 10 days. Take 9 of these raisins every day to get rid of knee pain. You can see your symptoms improve between 1 and 8 weeks depending on the severity and nature of the pain. 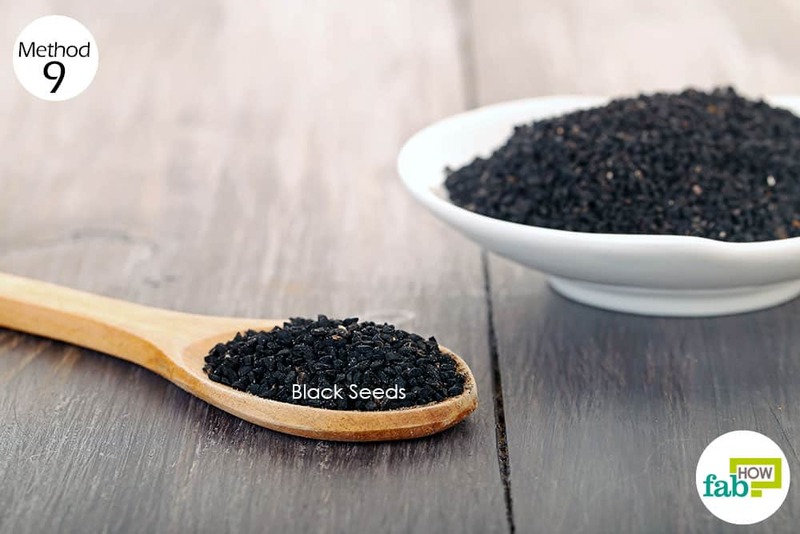 Black seed oil can even outdo Tylenol and ibuprofen as a pain reliever because of its anti-rheumatic and anti-inflammatory properties. (9) Try using it to massage your aching knee. Using circular strokes, apply the black seed oil on the affected knee. Let it get fully absorbed in the skin. Wait for an hour, and then wash it off with warm water. Repeat the remedy 2 times a day until the knee pain is gone. Bend one knee and place your foot flat on the floor. Keeping the other leg straight, raise it to the height of the bent knee. Hold it for 5 seconds, and then bring it to rest. Repeat 10 to 15 times for each leg. Do 2 to 3 sets for each knee. Stand facing the back of a sturdy chair or the back of a couch. Slowly raise the heels as high as you can. Hold on for 5 to 10 seconds, and then lower down. Repeat 10 to 15 times and do 3 sets to get rid of knee pain. When suffering from knee pain, avoid high-impact activities such as running or intense aerobics. To keep yourself active you can opt for swimming, jogging in water, or water aerobics. You can also consult your doctor for acupuncture therapy if you are suffering from rheumatoid arthritis or osteoarthritis. Avoid running after an injury. Also, walk on flat and soft surfaces. Avoid heat for up to 72 hours after a knee injury as heat exacerbates inflammation. Eat healthy for healthy bones and to maintain optimum weight. You can also get yourself a knee brace from the health store to support the injured knee. Jones BQ, Covey CJ, Sineath M. Nonsurgical Management of Knee Pain in Adults. AAFP Home. https://www.aafp.org/afp/2015/1115/p875.html. Published November 15, 2015. Breslin M, Lam P, Murrell GAC. Acute effects of cold therapy on knee skin surface ... BMJ Open Sport & Exercise Medicine. https://www.ncbi.nlm.nih.gov/pmc/articles/PMC5117055/. Published December 7, 2015. Atik D, Atik C, Karatepe C. The Effect of External Apple Vinegar Application on ... Evidence-based Complementary and Alternate Medicine. https://www.ncbi.nlm.nih.gov/pmc/articles/PMC4735895/. Published January 3, 2016. Hansson P, Jensen TS, Kvarstein, Strömberg M. Pain‐relieving effectiveness, quality of life and ... European Journal of Pain. https://www.researchgate.net/publication/322868677. Published May 22, 2018. Maroon JC, Bost JW, Maroon A. Natural anti-inflammatory agents for pain relief. Surgical Neurology International. http://surgicalneurologyint.com/surgicalint-articles/natural-anti-inflammatory-agents-for-pain-relief/. Published December 13, 2010. Andersen HH, Lo S, Gazerani P, Arendt-Nielsen L. Dose-response study of topical allyl isothiocyanate (mustard oil) as a human surrogate model of pain, hyperalgesia, and neurogenic inflammation. Pain. https://www.ncbi.nlm.nih.gov/pubmed/28614189. Published September 2017. Shaw G, Lee-Barthel A, Ross ML, Wang B, Baar K. Vitamin C-enriched gelatin supplementation before intermittent activity augments collagen synthesis. The American Journal of Clinical Nutrition. https://www.ncbi.nlm.nih.gov/pubmed/27852613. Published January 2017. Shmagel A, Onizuka N, Langsetmo L, et al. Low magnesium intake is associated with increased knee pain in subjects with radiographic knee osteoarthritis: data from the Osteoarthritis Initiative. Osteoarthritis Cartilage. https://www.ncbi.nlm.nih.gov/pubmed/29454594. Published May 2018. Kooshki A, Forouzan R, Rakhshani MH, Mohammadi M. Effect of Topical Application of Nigella Sativa Oil and Oral Acetaminophen on Pain in Elderly with Knee Osteoarthritis: A Crossover Clinical Trial. Electronic Physician. https://www.ncbi.nlm.nih.gov/pubmed/28344755. Published November 25, 2016. Peeler J, Ripat J. The effect of low-load exercise on joint pain, function, and activities of daily living in patients with knee osteoarthritis. The Knee. https://www.ncbi.nlm.nih.gov/pubmed/29325839. Published January 2018. With several ways you can get rid of knee pain, but the thing is what the best way is? The method you have described might be helpful, at the same time physical therapy can also be a better idea. Stay tuned for more such informative content.